The coverage obtained from any gallon of paint is dependent on its nonvolatile (solids) content. 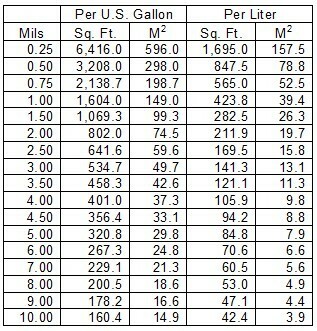 One gallon occupies a volume of 231 cubic inches or 0.1337 cubic feet. If a gallon of paint contained 100% solids and if it could be applied without losses, the coverage obtained from one gallon of such a paint applied to a film thickness of 1 mil (0.001 inch or 0.0000833 foot) would be 1604 square feet (.1337/.0000833). This figure is expressed as the theoretical coverage per gallon. Theoretical coverage per gallon is found in the Technical Data sections of Dampney product bulletins and is expressed as mil sq. ft. The term mil sq. ft. means that for a coating of given percent solids by volume (also found in the Technical Data sections), the coverage is the theoretical number of square feet covered by one gallon of paint spread at a thickness of 1 mil dry. For example, if a coating were 45% solids by volume, its theoretical coverage would be 1604 X 0.45 or 722 square feet at 1 mil dry film thickness. If a specification called for a dry film thickness of 2 mils, the theoretical coverage would then be 722 square feet divided by 2 mils, or 361 square feet per gallon. The wet film thickness required would be 2 divided by .45 or 4.4 mils. When adding thinner to a coating, consider the amount being added and its effect on spreading rate. For example, if a coating has a theoretical coverage rate of 600 mil sq. ft., and 1 pint of thinner per gallon is to be added, then the coverage rate is reduced to 533 mil sq. ft. (600 X 1 / 1.13). To compensate for can losses, windage, overspray and other waste, deduct 10% from the theoretical coverage rate. For heavily pitted structural steel, or for masonry, up to 50% of the theoretical coverage must be deducted from the first coat. In maintenance applications, two thin coats are preferable to one heavy coat. In some cases, such as high heat applications, too thick a coating can cause early failure. Always consult the appropriate Dampney product bulletin for specific recommendations. Catalyzed Coatings: In cases where catalyzed coatings are used, application conditions are critical. Pot life decreases as temperature increases, and cure time increases as temperature decreases. Refer to Technical Data sections in product bulletins for specific recommendations. Service Conditions: Service conditions determine which coatings may be used for specific applications. These include: temperature, humidity, atmospheric exposure, etc. Always be sure of the anticipated temperature and humidity variations, weather conditions and chemical exposure. Before using coatings, become familiar with applicable product bulletins, label instructions, and Material Safety Data Sheets.